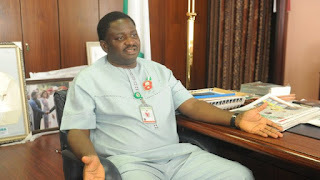 Femi Adesina, Special Adviser to the President on Media and Publicity, has slammed critics of the current administration, saying only the “willfully blind” will not see its “good works” in the economy. He said this on Friday in a statement tagged ‘The Economy: Facts Are Stubborn Things’, which he released via his social media accounts. Adesina said some of President Muhammadu Buhari’s critics “carry on as if it is doom and gloom all the way” to score political points. The statement reads; “Some people have made it a pastime to talk as if there is no silver lining in the sky as far as the Nigerian economy is concerned. They carry on as if it is doom and gloom all the way, a thoroughfare of woes. This they do, to hoodwink the public, and peradventure gain political advantage for themselves, or their principals. “According to the National Bureau of Statistics (NBS), the economy has recovered from the slow-down and eventual recession, which started in 2014. There has been improvement with stronger growth for three successive quarters. From contracting by 0.91% in Q1 2017, the economy has grown by 0.72% in Q2 2017, to 1.17% in Q3 2017, and 2.11% in Q4 2017. “The Q1 2018 GDP shows that the economy has recorded a GDP growth of 1.95%, compared to a contraction of 0.91% in Q1 2017. “The growth is driven by Agriculture and Industry, which shows that finally, after more than 50 years of lip service, the Nigerian economy is on the road to diversification. The oil sector's contribution to GDP is 9.61%, while non-oil sector's share is 90.39%. “One of the factors responsible for the positive performance of the economy in Q1 2018 was the spending of about N1.5 trillion on infrastructure projects in 2017. “For the past 15 months, inflation has declined consistently from 18.72% to 12.48%. The country is steadily on the road to single digit inflation rate. “The first quarter of 2018 saw a continuous growth in total capital importation into the country, the fourth consecutive quarterly increase since Q2 2017. The total value of capital imported is $6,303.63 million, a 17.11% growth over the figure reported in the previous quarter. “Foreign reserves stand at $47.79 billion, compared to $29.6 billion inherited in May 2015, after about six years boom in oil prices in the international market. The increase came at a time of modest oil prices, showing transparency and accountability by government. “Nigeria's Stock Market ended 2017 as one of the best-performing in the world, with returns of about 40 percent. “Tax revenue increased to N1.17 trillion, in Q1 2018, a 51% increase on the Q1 2017 figure. “Milled rice production has increased from 2.5MT to 4MT, and rice imports have dropped from 580,000MT in 2015 to 58,000MT in 2016. Millions of dollars have been saved. “These are just little among the good things happening to the Nigerian economy. Only the wilfully blind will not see it, but it does not stop the good work, which continues.